This is my mom’s recipe and I love it. 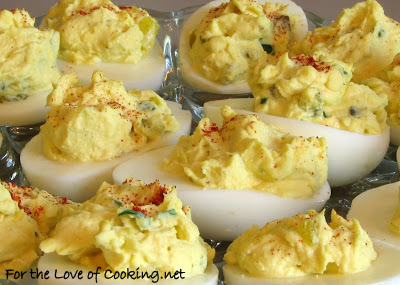 I grew up eating these eggs and look forward to having them every time I visit my parents. It’s a perfect appetizer to take to any party. Place the eggs in cold water and peel the shells off. Cut the eggs in half lengthwise so they are stable. Clean out the center yolks with a spoon into a shallow bowl. Use a fork and smash them until they are really smooth. Add the dill pickle, green onion, pickle juice, mayonnaise, dried mustard, salt and pepper then mix thoroughly. Taste and re-season if necessary. Spoon mixture back into the egg halves. Sprinkle tops with paprika. Enjoy. 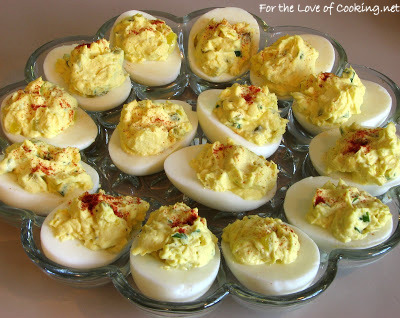 I love Deviled Eggs! I just don’t make them enough. And the addition of pickle sounds so good!